For the second year in a row, last week’s co-located Audio Engineering Society’s AES Convention and the National Association of Broadcasters’ NAB Show New York at the Javits Center proved a synergistic winner for both organizations and their constituencies. The NAB Show New York reported a total registered attendance of 15,097, a 6.1% increase over the 2017 event. The event included 300-plus exhibitors, 67 of which were participating for the first time. 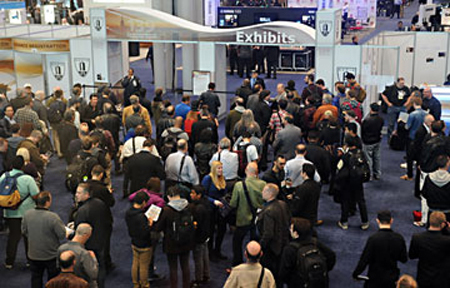 The AES Convention, whose exhibitor expo ran a day longer than NAB’s and whose conference program was two days longer, had a registered attendance of approximately 15,000, roughly even with last year’s numbers, according to Director, Communications, Frank Wells. The program also dedicated several areas to specific technologies and standards. Among them was a new Audio over IP Technology Pavilion, presented in partnership with the Alliance for IP Media Solutions (AIMS), where leading manufacturers provided three days of application and product sessions to guide professionals toward enhanced productivity with AoIP. Major sessions in the technical program covered Broadcast & Online Delivery, Applications in Audio, Sound Reinforcement, Recording & Production, Game Audio/AVAR/Spatial Audio, Networked Audio, and Product Development. Demo rooms offered an opportunity to turn up the volume to experience new audio formats, such as the Dolby Atmos demonstrations by JBL, PMC, and Genelec. System demonstrations were also offered by Alteros, Meyer Sound, Sennheiser/Neumann, Nexo and Yamaha. The NAB Show NY conference program, subtitled “Media in Action,” was considerably smaller and focused on content for broadcast and OTT, with what some attendees noticed was a decreased emphasis on technology. One day’s schedule included three separate sessions on podcasting. With NAB’s content emphasis and the AES’s focus on audio standards, distribution and control technologies, and IP and other platforms, several exhibitors — Riedel, Lawo, and Clear-Com among them — hosted booths on both sides of the combined show (which were linked by an open hallway in the rear of the convention center). “It was a good opportunity to have a presence on all aspects of broadcast, including sports and entertainment, and in line with our strategy of focusing on more regional sales,” says Jeff Smith, Lawo’s new head of U.S. sales. The AES conference program was as varied as it was sprawling and, in more than a few cases, brought the evolving narrative of broadcast-sports audio to a wider audience. For example, Ben Escobedo, senior market development specialist, professional audio, Shure, interviewed CP Communications President Michael Mason on sound-capture techniques and technology as well as some of the more esoteric aspects of the business. “Shipping lithium batteries is a logistical nightmare,” he told the audience, because they’re banned from flights, with the FAA imposing $10,000 fines per offending battery. In another panel, Rob France, senior product marketing manager, Dolby, and NBC Sports Karl Malone, director, sound design, NBC Sports and NBC Olympics, discussed the application of Dolby Atmos to sports on television. Malone whimsically called immersive audio for broadcast “ear-opening” and, more seriously, regards it as “absolutely vital” to the future of sports television. But, he cautioned, more emphasis has to be placed on the virtualization of the immersive experience, to make it translate compellingly through mediums like soundbars to reach consumers. Dolby Atmos had a substantial presence at the AES conference, but Fraunhofer’s MPEG–H codec, which China’s state-owned CCTV network recently okayed for use as part of the country’s broadcast standard, also underwent testing during the French Open and the European Athletic Championships over the summer. “We’ve also done testing of it for satellite transmission,” says Fraunhofer VP Robert Bleidt. The conference program also hosted two three-hour-long sessions. The RF Super Session’s length underscored how complex and unpredictable the RF-wireless-microphone landscape remains in the wake of frequency reallocation. The session took place at an auspicious point in that narrative: as of this month, several panelists pointed out, it is illegal to manufacture wireless systems for use above 608 MHz. The continued lack of a viable database to manage remaining frequencies was another refrain. In the Intercom Systems Super Session, reps from Clear-Com, Pliant Technologies, Radio Active Designs, Riedel, RTS, and Unity Intercom examined various approaches to back-channel communications for broadcast and live events. Turner Sports VP, Operations and Technology, Tom Sahara discussed production of the audio of this year’s March Madness suite of college basketball games. Backed by colleagues Senior Media Transport Architect Bob Baker and Senior Production Engineer Erinn Thorp, he recounted the entire audio-signal path from originating the mix at the game venues, from on-campus sports facilities to professional sports arenas; capturing and packaging all the game feeds into an assortment of consumer products; and delivering that experience across a wide assortment of devices, while trying to create a consistent audio experience across multiple venues and delivery formats. Sahara’s keynote as DTV Audio Group chairman focused on what he sees as an imminent inflection point in broadcast’s business model: its do-more-with-less mantra will compel more efficiencies, such as greater use of REMI-type remote-production techniques, and increased use of virtualized and centralized production. Other topics covered included an Atmos live-production update and a look into defining premium audio quality across divergent platforms. The 2019 gatherings will also be co-located at Javits Center: NAB Show New York Oct. 16-17, the AES Convention Oct. 16-19.